The Sign of Jonas – Baptism, resurrection, repentance and obedience. Everyone knows the sign of Jonas. He was three days in the fish, and then he came out. It’s a type of the Resurrection. But the Lord shows from the context that the sign of Jonas is much more than the Resurrection. The Resurrection, out of context, gives life to no one. Only if the Resurrection is lived, only if the Commandments are followed, does the Resurrection give life. So the sign of Jonas is about life, (that is, how to live) not just about that the Lord was going to be resurrected. It speaks of our resurrection and also our baptism because, after all, Jonas came out of the water – so it’s a type of baptism also. The Lord judged those people of that generation because they were not going to listen to this sign. They already were judging Him, trying to put Him to death. Many of them, after the Resurrection, would make up false stories about it. Now, what happened in the life of Jonas, if you want to summarize it really quickly? He was disobedient. He was told to do something by the Lord. He didn’t want to do it, and he saw that it was dangerous to not do the Lord’s will. He fell into great peril, and was saved by the Lord. Then He repented. What happened afterwards is as important as the resurrection – that is – Jonas obeyed. Now, as we see in the story, he obeyed although he still had his rough spots. He still was not perfect in his obedience — We don’t call him the doubting prophet for nothing. But he obeyed. It is not something that happens instantaneously. It’s not something we do perfectly and completely every single day. It’s something that we strive for and make an effort towards. So Jonas obeyed after he was resurrected — or, shall we say, since he was in the water — after he was baptized. He is cast out by baptism. And what happens? The house of the man is garnished and swept. But the demon, after being out for a while, says: I’m going to return to the house from whence I came out. When he comes, he finds it empty, swept and garnished. Swept and garnished is a good thing. Baptism should clean us and baptism should make us beautiful. But if our soul is empty, the demon will come back in; the passions will come back in. So the sign of Jonas is not just Resurrection. It is baptism and it is repentance after baptism. It is changing our way of life after baptism. And the Jews that were listening to the Lord, many of them were not about to change their way of life. And that is why the Lord said, this is the sign that you will get, the sign of Jonas. Not just that He is pointing to the Resurrection, but also pointing to what we should do after baptism, which is our resurrection, isn’t it? Isn’t it what makes us capable of being resurrected? So what we should do after our baptism, our resurrection, is live a life of repentance. That’s the sign of Jonas. May God help us to live according to this sign of Jonas. Since we have been baptized, let us take care that our soul remains swept and garnished but never empty. Our soul should always be filled with the Holy Spirit and then the evil spirit, when he comes anywhere near us, will be filled with fear and will not be able to enter us. Amen. Matthew 12:38-45 38 Then certain of the scribes and of the Pharisees answered, saying, Master, we would see a sign from thee. 39 But he answered and said unto them, An evil and adulterous generation seeketh after a sign; and there shall no sign be given to it, but the sign of the prophet Jonas: 40 For as Jonas was three days and three nights in the whale's belly; so shall the Son of man be three days and three nights in the heart of the earth. 41 The men of Nineveh shall rise in judgment with this generation, and shall condemn it: because they repented at the preaching of Jonas; and, behold, a greater than Jonas is here. 42 The queen of the south shall rise up in the judgment with this generation, and shall condemn it: for she came from the uttermost parts of the earth to hear the wisdom of Solomon; and, behold, a greater than Solomon is here. 43 When the unclean spirit is gone out of a man, he walketh through dry places, seeking rest, and findeth none. 44 Then he saith, I will return into my house from whence I came out; and when he is come, he findeth it empty, swept, and garnished. 45 Then goeth he, and taketh with himself seven other spirits more wicked than himself, and they enter in and dwell there: and the last state of that man is worse than the first. Even so shall it be also unto this wicked generation. This Sunday's readings are continuous, near the beginning of Matthew. They should be read as a whole and contain important instructions in three things that are absolutely necessary to be saved. We must decide to follow Christ, leave our nets, and climb to top of the Mountain, (the only place) where Christ is. Without simple resolutions on our part, we cannot ever understand the truth about the God-man, Jesus Christ. Personal request: I am always interested in improving the message. I thought my homily was one of my best, but when I asked for some feedback, I was told I rambled a bit and treid to say too much, and that it was too long. I would appreciate honest critical comments. This subject is at the core of what I try to teach my flock, and I want to do it well. Matthew 4:18-23, 4:25-5:12 18 And Jesus, walking by the sea of Galilee, saw two brethren, Simon called Peter, and Andrew his brother, casting a net into the sea: for they were fishers. 19 And he saith unto them, Follow me, and I will make you fishers of men. 20 And they straightway left their nets, and followed him. 21 And going on from thence, he saw other two brethren, James the son of Zebedee, and John his brother, in a ship with Zebedee their father, mending their nets; and he called them. 22 And they immediately left the ship and their father, and followed him. 23 And Jesus went about all Galilee, teaching in their synagogues, and preaching the gospel of the kingdom, and healing all manner of sickness and all manner of disease among the people. … 25 And there followed him great multitudes of people from Galilee, and from Decapolis, and from Jerusalem, and from Judaea, and from beyond Jordan. 1 And seeing the multitudes, he went up into a mountain: and when he was set, his disciples came unto him: 2 And he opened his mouth, and taught them, saying, 3 Blessed are the poor in spirit: for theirs is the kingdom of heaven. 4 Blessed are they that mourn: for they shall be comforted. 5 Blessed are the meek: for they shall inherit the earth. 6 Blessed are they which do hunger and thirst after righteousness: for they shall be filled. 7 Blessed are the merciful: for they shall obtain mercy. 8 Blessed are the pure in heart: for they shall see God. 9 Blessed are the peacemakers: for they shall be called the children of God. 10 Blessed are they which are persecuted for righteousness' sake: for theirs is the kingdom of heaven. 11 Blessed are ye, when men shall revile you, and persecute you, and shall say all manner of evil against you falsely, for my sake. 12 Rejoice, and be exceeding glad: for great is your reward in heaven: for so persecuted they the prophets which were before you. To live in the resurrection, we must know Jesus Christ. Brothers and sisters, on this bright day of the resurrection of the Lord Jesus Christ, we read from the beginning of the Gospel of John, which does not say anything about resurrection. There are many passages in the Gospels that speak about the resurrection; we read eleven of them in a cycle throughout the year in matins, but we did not read this time about the resurrection. We read about it this morning, but not this evening. Now why is this, that on the very day when we most extravagantly celebrate the resurrection we read from the beginning of John and not a resurrection story? Well, we certainly know about the resurrection, but have we lived it yet? Who is the resurrection? – Jesus Christ. Saint John, preeminently, of all the Apostles and Evangelists, shows us Who Jesus Christ is. In order for the resurrection to be actualized in our life, we must know Jesus Christ. So it is apropos that from this day forward, during the cycle of Pascha, for fort days an onwards – forty days after Pascha is the Ascension and fifty days after is Pentecost – we read from the Gospel of John because we are to learn of Jesus Christ, the One who is meek and lowly, the One Who came to save us from our sins. Just knowing this does not make it happen – we must live according to Who Jesus Christ is. The joy of the resurrection is that we can become completely alive, completely human, as we are meant to be. Right now, brothers and sisters, we are in a state that is between human and not human. God created us to know Him perfectly and intimately. Since we do not, we are not quite what we should be. But the joy of the resurrection is that we can become this. Jesus Christ became like us in all things except for sin. And He lived on this earth as a man and also fully as God, having two natures, not intermixed, but cooperating with one-another. And His human nature is as ours should be. It was as ours in all things except sin, even to the point that it would die, because we know that our Lord dies on the cross. But then a wondrous thing happened. Of His own power, of His Divinity – the hymns of Holy Saturday especially sing of it – the one Who created the universe, Who laid dead in tomb, became alive of His own power. And He imbued humanity with the ability to be alive too. This is what we are celebrating, brothers and sisters! We are not celebrating merely the event of Christ rising from the dead; we are celebrating that reality that WE can rise from the dead. So right now, brothers and sisters, we should live according to the resurrection, in everything. And as we live in this light, we become light; we become peaceful. Now let’s be honest with ourselves: there is a lot in us that is not peaceful; there is a lot in us that is not light. But God came so that we could be ALL LIGHT. That is what we are celebrating today. He resurrected Himself so that we could become resurrected. For Him it happened in a flash, in a moment. For us it happens in a lifetime, with struggle, with difficulties, with happiness, with sadness, with holiness and with depravity – all the things that are mixed up in our complex nature. But I tell you, God’s nature is not complex – He is only good. And that is what we are to become – simple and only good. And our Lord Jesus Christ, although he was man, was simple, because He was only good as man, and only good as God. And He made us capable of becoming good, and fully human. This is what we celebrate today, and this is why we start reading the Gospel of John today – because you cannot know the resurrection unless you know Jesus Christ. It is not possible. And there is only one way to know Jesus Christ – to become like Him. That is what we are called to do. And the great joy is that it is possible – God came so we could become like Him. This is what we celebrate today, bothers and sisters. Anything that you do in your life, no matter what it is, no matter how small or how large, no matter how long it takes, or if it is just for a moment — if it is according to the resurrection, then it will bring you light. Anything that you do that is not according to the resurrection only brings darkness. Certainly we live in a complex life, with complex decisions to make about things and difficulties that we are perplexed about – this is true. But basically life is – choose good and avoid evil. Not becomes the Lord commands, but because it is the only way to have life. So we celebrate today that we can have life. Brothers and sisters, this life is in knowing our Lord Jesus Christ; that is why we read the Gospel of John. After a feast, the church will have hymns that discuss the feast in a deeper way. You will see this all throughout the whole period of Pascha. All the Gospels for Sunday are about the gradual enlightenment of man, because the resurrection occurs in us bit by bit. You can see it how it happened to the women, to the apostles. At first they could not believe, at first they were afraid. At first the Apostles thought that the words of the women who announced the resurrection were nonsense. Thomas could not believe for eight days. Peter could not have the joy of the resurrection until the risen Lord had them go fishing and then He restored him after they caught many fish. This is the way life is, brothers and sisters. It takes time to be enlightened; it takes effort to be enlightened. And the church will speak of it over the next forty and fifty days. So the Gospel of John is sort of the prelude to all that. The church IS Jesus Christ. All truth is Jesus Christ. The truth is not an abstract concept; truth is a person – Jesus Christ. So when you say that you live according to the truth that means that you are becoming like Christ. The Gospel of John teaches us preeminently Who Jesus Christ is, but it cannot be learned just by reading – it can only be learned by … becoming. So let us celebrate today that we can become like as God; we can become light, with no darkness in us at all; we can become arisen, with no death in us at all. This is what we were created for, and this is what we celebrate. May God bless you and help you to live in the light of the resurrection. On the Sunday before the Nativity of Christ, we remember the Holy Fathers (the ancestors of Christ) and read the genealogy of Christ, from the Gospel of Matthew. There are many lessons in this genealogy, which may be gleaned by looking at it as a whole, and also examining the individuals mentioned. What was Judas and Thamar’s relationship? Tell the circumstances of the conception. The even more important and marvelous circumstances of the birth of Phares and Zara are discussed in the next question. Later, Judah became aware that Thamar was pregnant, not knowing that he had lain with her. He hypocritically wanted to punish her, but her craftiness (when she asked for a pledge before her harlotry) saved her, and was very instructive to Judah. Marvelous are the works of God. Out of a sinful, incestual union is raised up the Son of God. The blood of harlots and fornicators beats in his heart. He has truly taken on all of our sins, and made everything clean, as even his genealogy shows. Tell the story of Phares and Zara. How were they conceived? What is the theological significance of the way they were born? Phares and Zara were born of harlotry, described in the question above. Their names are very significant, and are descriptive of the birth process, and the economy of God, and the salvation of man. This story has great theological significance. If we were to read the scriptures in isolation, and try to glean meaning with little understanding, we would miss much of the significant meaning in passages such as this. Fortunately, we, who are not holy, have the holy Fathers, who have expressed wondrously the mind of the church, and helped illuminate the sometimes dark sayings of holy writ. Phares was aptly named, as he interfered with the natural order. The babe who put his hand out of the womb first should have been born first. Zara first showed his hand and then withdrew it, and so to did the life of Christ appear in the holy ones who lived before the circumcision (such men as Adam, and Seth, and Enoch, and Noah, Job, Melchisedec, and the rest). When the law came, this way of life receded. Later, with the coming of Christ, it blossomed forth again, through the blood of Christ, which was prophesied by the scarlet thread. What sort of woman was Rachab? Tell the important story associated with her. Rachab was a harlot, who dwelt in the pagan land of Canaan, in the city of Jericho. When Joshua, the son of Nun wished to conquer Jericho, he sent spies into the city to gather military intelligence. These spies stayed with Rachab. Rachab was a wise woman, who knew of the exploits of the Jews; this knowledge found a fertile place in her heart, and she, a pagan, believed in the true God. Who was Ruth? Tell of her life previous to meeting Boaz. What might we glean from her marriage to Boaz? Ruth was steadfast in her resolve, amazing Naomi. Ruth passionately declared her belief in the true God, and her fidelity to him. Do not her words stir the blood, even now? Ruth and Naomi went to Jerusalem, where they were so poor they needed to glean the leftover wheat from the fields. God rewarded her steadfast faith, expressed not only in words, but also deeds, and found the stranger and pilgrim Ruth a husband. Boaz saw her, and was kind to her. Who was the former wife of Urias? Why did she conceive a son by David? The former wife of Urias was Bathsheba. She was a beautiful women, whom David saw bathing, while he was reclining in idleness. He lusted for her, and committed adultery, and was so taken with her that he arranged for her husband Urias, who was in battle, to be put at the front, so that he was killed. Thus was David guilty of both adultery and murder. Eventually, out of their union came Solomon, who continued the line of Christ. How inscrutable are God’s ways! How great is his condescension! The God-man counts as his ancestors harlots and strangers, and adulterers and murderers. Can there be any doubt that there is no sin too great for His mercy to cover? "Of which then is it necessary to speak first? How the Virgin is of David. How then shall we know that she is of David? Hearken unto God, telling Gabriel to go unto "a virgin betrothed to a man (whose name was Joseph), of the house and lineage of David." What now wouldest thou have plainer than this, when thou hast heard that the Virgin was of the house and lineage of David?" Who was the mother of Isaac? Why was Isaac so named? Sarah was the mother of Isaac. He is so named because Abraham and Sarah both initially disbelieved when they heard that she would bear a child, and laughed. Isaac means laughter. Sarah was great in years, and had been barren, and according to all worldly wisdom, having a child was impossible. This is why they laughed. Later, when the three angels appeared to Abraham, it was Sarah’s turn to laugh. If God has raised a great nation out of barrenness, is this not a sign to us, that he will raise our barren souls up to the knowledge of Himself? This story is not merely a quaint tale, but a spiritual reality. We can indeed be raised up, and all that is barren in us can become fruitful, if only we truly believe, and struggle with ourselves. What is Isaac a "type" of? A "type" is a foreshadowing of something to come. For example, when Moses stuck his staff three times in the bitter waters of Marah, and they became sweet, this was a foreshadowing, or "type": of baptism. The burning bush, which burnt, but was not consumed, was a "type" of the Theotokos, who, being a mortal, bore divinity in her womb, and was not consumed. There are hundreds of "types" in the Old Testament. Isaac is a type of Christ. Remember when Abraham was told to sacrifice Isaac? Since Abraham was to be the father of many nations, so too was Isaac, as his progeny. So too is Christ the "Author and finisher of our faith" (Heb 12:2), and He sacrificed Himself for our sake. Our tradition tells us that Isaac did not resist his father, and would have gone willingly to his death, if the angel had not intervened. Who is the mother of Jacob? Who were Jacob’s wives? How did he obtain them? The Great canon of St Andrew of Crete attaches an important symbolic meaning to Jacobs’s two wives. What do they represent? The mother of Jacob was Rebecca. Jacob had two wives. They were both daughters of Laban, under whom Jacob whom Jacob worked for seven years, in order to marry the youngest, Rachel, whom he loved. The eldest was Leah. After Jacob did his service, on the wedding day, Laban tricked Jacob by substituting Leah for Rachel. This was possible because of veils! Jacob was allowed to marry Rachel also, after contracting for another seven years of service. Because of his crying need the Patriarch endured the scorching heat of the day, and he bore the frost of the night, daily making gains, shepherding, struggling, slaving, in order to make 2 wives. By the two wives understand action and direct knowledge in contemplation; Leah as action, for she had many children, and Rachel as knowledge, which is obtained by much labor. For without labors, my soul, neither action nor contemplation will achieve success. Who was the second to the youngest of Judah‘s brethren? He is also an important "type". Leah bore the first many sons of Jacob, including Judah. Altogether, she bore six of the twelve patriarchs. The penultimate son of Jacob, and the second youngest brother of Judas, was Joseph. Another glimpse into his remarkable life. Patriarch Pavle reposed recently and was buried last week. You can find video of his funeral on the Internet if you want, but I am more concerned with descriptions of the man, who was a rare man in our day, a bishop who was humble, and holy, and a pastor. Dear Fr. Victor please bless! With your blessing, I wanted to send out the following email to the parishioners as this is the third day of the repose of His Holiness Pavle of Serbia. Greetings from Cyprus! I am writing because today is the third day of the repose of His Holiness Patriarch (Archbishop of Pec) Pavle of Serbia and I would like to ask for your prayers for his soul. Most Serbs revered His Holiness as a living saint not only for his exceptional piety and gifts but because he stood as a living example of one who forgave his enemies and blessed those that cursed him. His Holiness saw many of those dear to him (including many of his own family) murdered during the trials and conflicts of Kosovo–apart from witnessing the legions of shrines destroyed in Kosovo during his time as bishop there. Nonetheless, he evidently fought those who objected to him offering prayers during the Liturgy for both Serbs and their physical enemies–the Croats, the Albanians and even the Americans–stressing that only by forgiving and loving our enemies will these trials of the Serbs come to have any value before God. Such an application of Christ’s Commandments, particularly in such extreme conditions, is hard for me to contemplate as an American or as a Westerner since I have never felt the threat of my people being extinguished merely because of what they believe. However, as an Orthodox, the threat that has faced (and still faces the Serbs) is clear since, if we remain strong in our beliefs, we too shall face it. Thus, His Holiness always taught that we should cling to our beliefs and to our cultural identity as though they are the only things that matter in this world–because they are. There are scores of examples where His Holiness demonstrated that he was truly worthy of that title, not just as archbishop but as a person. He was so humble that he relocated the Liturgy he once served daily at the Patriarchate to the cafeteria across the street simply because others in the office complained. He then served coffee to the worshippers after conducting the Liturgy: during which he had used a curtain for a makeshift prothesis. In other examples, he healed, inspired and soothed simply by his prayers, homilies and mere presence. In my own case, after praying to Sts. Savas and Vassileos (of Ostrog) for the opportunity, I was blessed to meet His Holiness just earlier this year while on a business trip to Belgrade. I sought his prayers for my two, sick children. Meeting him itself was remarkable: upon arriving to his hospital floor, the whole place smelled of myrrh. The priest who escorted me said, "I know, I know, that is just his smell"! After receiving his blessing, both my children have had remarkable and almost complete recoveries, despite initially more modest prognoses. I am sure that in the days that follow many will come forward with remarkable stories about His Holiness Pavle. However, in focusing on this particular day–the third day of his repose–I wanted to share some of what I know of his life so that you might pray for him as you would for one of my friends or relatives, as that is how I see him. I know that he constantly prayed for all of us so this would seem to be the least that we could do. 4th Sun after Pentecost 2009. Examining the faith of the centurion. Audio Homily. Matthew 8:5-13 And when Jesus was entered into Capernaum, there came unto him a centurion, beseeching him, 6 And saying, Lord, my servant lieth at home sick of the palsy, grievously tormented. 7 And Jesus saith unto him, I will come and heal him. 8 The centurion answered and said, Lord, I am not worthy that thou shouldest come under my roof: but speak the word only, and my servant shall be healed. 9 For I am a man under authority, having soldiers under me: and I say to this man, Go, and he goeth; and to another, Come, and he cometh; and to my servant, Do this, and he doeth it. 10 When Jesus heard it, he marvelled, and said to them that followed, Verily I say unto you, I have not found so great faith, no, not in Israel. 11 And I say unto you, That many shall come from the east and west, and shall sit down with Abraham, and Isaac, and Jacob, in the kingdom of heaven. 12 But the children of the kingdom shall be cast out into outer darkness: there shall be weeping and gnashing of teeth. 13 And Jesus said unto the centurion, Go thy way; and as thou hast believed, so be it done unto thee. And his servant was healed in the selfsame hour. 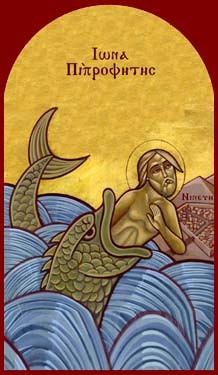 Sunday after Theophany 2009: Repent: for the kingdom of heaven is at hand. Matthew 4:12-17 Now when Jesus had heard that John was cast into prison, he departed into Galilee; 13 And leaving Nazareth, he came and dwelt in Capernaum, which is upon the sea coast, in the borders of Zabulon and Nephthalim: 14 That it might be fulfilled which was spoken by Esaias the prophet, saying, 15 The land of Zabulon, and the land of Nephthalim, by the way of the sea, beyond Jordan, Galilee of the Gentiles; 16 The people which sat in darkness saw great light; and to them which sat in the region and shadow of death light is sprung up. 17 From that time Jesus began to preach, and to say, Repent: for the kingdom of heaven is at hand. Sunday after Nativity 2009. Things are not as they seem! Matthew 2:13-23 13 And when they were departed, behold, the angel of the Lord appeareth to Joseph in a dream, saying, Arise, and take the young child and his mother, and flee into Egypt, and be thou there until I bring thee word: for Herod will seek the young child to destroy him. 14 When he arose, he took the young child and his mother by night, and departed into Egypt: 15 And was there until the death of Herod: that it might be fulfilled which was spoken of the Lord by the prophet, saying, Out of Egypt have I called my son. 16 Then Herod, when he saw that he was mocked of the wise men, was exceeding wroth, and sent forth, and slew all the children that were in Bethlehem, and in all the coasts thereof, from two years old and under, according to the time which he had diligently enquired of the wise men. 17 Then was fulfilled that which was spoken by Jeremy the prophet, saying, 18 In Rama was there a voice heard, lamentation, and weeping, and great mourning, Rachel weeping for her children, and would not be comforted, because they are not. 19 But when Herod was dead, behold, an angel of the Lord appeareth in a dream to Joseph in Egypt, 20 Saying, Arise, and take the young child and his mother, and go into the land of Israel: for they are dead which sought the young child’s life. 21 And he arose, and took the young child and his mother, and came into the land of Israel. 22 But when he heard that Archelaus did reign in Judaea in the room of his father Herod, he was afraid to go thither: notwithstanding, being warned of God in a dream, he turned aside into the parts of Galilee: 23 And he came and dwelt in a city called Nazareth: that it might be fulfilled which was spoken by the prophets, He shall be called a Nazarene. You are currently browsing the archives for the Gospel:Matthew category.